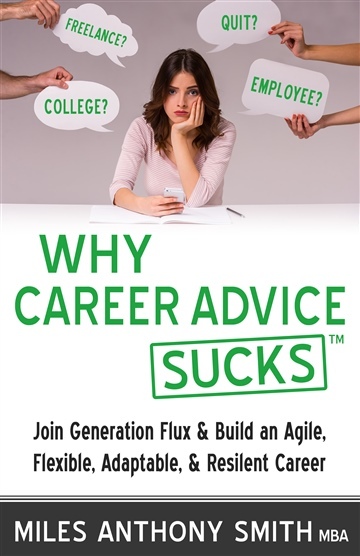 Why Are Careers in Flux? 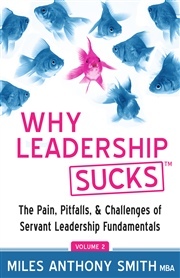 Are you lost, hopeless, or angry in your job search? Do you feel alone, cheated, ripped off, or not sure what to do next? Or are you curious to understand the massive shift in the job hunting market currently rippling through the career transition landscape? What if you could understand what is driving this sea change and how Generation Flux is flourishing? Is College Worth it Anymore? Most of us have been told or believed that going to college after high school was worth it in the long run. But is student loan debt really worth the investment? Or is it a debt trap? What if following the traditional career path, with its promise of a retirement pension after 20 or 30 years of dedicated service is not as secure as we think? The good news is that even though the definition of career success is changing, seeming instability in income and job tenure can also lead to be a more rewarding and fulfilling career. With 15 years of twists and turns, Miles Anthony Smith delves into the ups and downs of his career, shares many funny, some sad, and other frustrating stories that will have you laughing and crying as you earn an advanced degree through his many mistakes and missteps. He paints a future of growing complexity where career success is defined by those who are willing to take calculated risks. 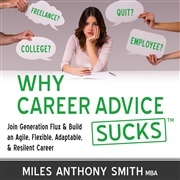 Miles will guide you on a job search journey to understand the past, confront the career development present, and conquer future career success no matter what the job market throws your way. Part 2: Stop The Education Madness! 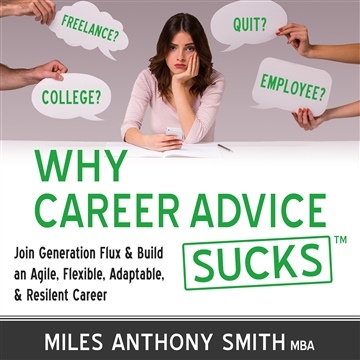 Get a sample of this book now to decrease your confusion, stress, and frustration with your career. The career advice in these pages is genuinely worth far more than the simple investment you will make. Increased profit margin from -10% to +27% by restructuring the company and repositioning its focus on new line of products. Born a Hoosier, raised an Okie, and currently residing in the Frozen Tundra of Green Bay, Wisconsin, Miles Anthony Smith is a happily married husband of Carolyn and a proud father of three. Now in his mid-30s, he was fortunate to have been given a significant leadership opportunity by his father at the age of 25. He is a classically trained violist, violinist, and composer, with passion in the fields of small-business management, marketing, macroeconomics, servant leadership, Classical education, and Christian apologetics. 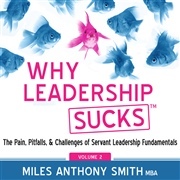 Miles, a Gen X'er leader and author, cares enough about organizational health to make the tough decisions, hire and coach the right people, set clear expectations, develop a strong team culture, and strengthen organizational cash flow, exhibiting both humility and fierce resolve. His mission in life is "To Chart the Course, Pave the Pathway, and Light the Lane for Others to Eclipse My Own Success in Leadership." As the Great Recession lingers and the job market remains a dark, dingy, and competitive place, it's becoming more and more clear that things are never going to be as they once were. Smith is, luckily, the perfect person to take readers on this journey. Even the way in which he writes this book, flitting from topic to topic and cramming these 180 pages full of intriguing questions and conversations, makes it clear that Smith is one of the chaos-embracing individuals that define Generation Flux. As you can see from the title of the book and the four parts, Miles Anthony Smith does not stray away from controversial topics. However, it's not too shocking given the employment issues the United States has been embroiled in for half a dozen years. In this book, Smith analyzes the changes in the job market and discusses ways for people to survive. Smith also doesn't come across as a stuffy academic who is spouting examples that he has never experienced firsthand. 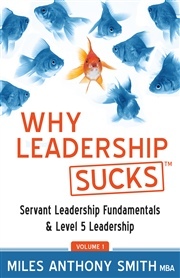 The author is part of Generation Flux, and he is sharing his knowledge and advice from the trenches. This book might irritate or frighten readers, but it will make people think. This is a scary time in history and Smith is bold enough to tell it like he sees it. 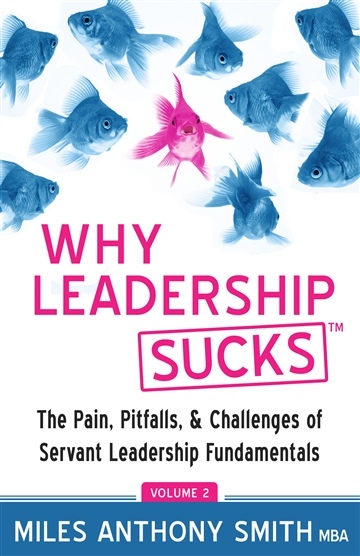 There's no denying the job market is evolving so do yourself a favor, consider reading this book. You don't have to agree with everything, but it will behoove you to listen.